A stroboscope, also called a strobe light or strobe tachometer, can be used to measure the rotation speed or revolution velocity and frequency of rotating, vibrating or moving parts, components and equipment. The flash frequency of a stroboscope is adjustable to ensure accurate measurement of these parameters. A stroboscope is a handy tool for any plant, as a stroboscope can be used to quickly find and replace worn belts, springs, valves and dampers as part of a manufacturer's condition monitoring or preventative maintenance plan. A stroboscope also can be used to adjust machinery to streamline or improve performance. 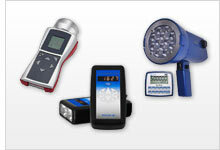 PCE Instruments (PCE) offers a number of handheld stroboscope products as well as stationary stroboscope models. Many handheld stroboscope products have rechargeable batteries, making them truly portable and ideal for use on the production floor. Some stroboscope models have high-intensity light sources of 600 to 900 lux at a distance of 1 meter (approximately 3.28 feet). Depending on the model, a stroboscope can record and save measurement data to an internal memory or SD memory card. These data-recording or data-logging stroboscope products allow measurement data to be transferred to a computer for detailed analysis and printing. If you have any questions, please contact PCE's technical sales and customer support team at or +44 (0) 2380 987 035 for PCE Instruments UK , or at or +1 (561) 320-9162 for PCE Americas Inc.
PCE-OM 15 is a handheld stroboscope or strobe tachometer with trigger functionality. This easy-to-use portable digital stroboscope gun features high / low range selection and push-button rate control to scale the flash rate slower (x½) and faster (x2). In addition, two knobs allow coarse and fine adjustment of the flash rate. The PCE-LES 100 Stroboscope combines LED technology with compact and accurate electronics, which controls the sequence and timing of flash over the entire measuring range. Thanks to LED technology, the stroboscope does not need periodic changing of bulbs. The stroboscope is sent to you calibrated (by the manufacturer PCE Instruments). The Stroboscope Nova Strobe dbl Kit is used for speed and vibration measurements or observations of movement. Stationary stroboscope with intelligent LED-technology. The main advantage of a steady-state stroboscope RT STROBE 5000 LED with intelligent LED-technology results from the absence of a short life xenon-tube, which is usually the first part which has to be replaced. The main advantage of a steady-state stroboscope RT STROBE 7000 LED with intelligent LED-technology results from the absence of a short life xenon-tube. The STROBE 7000 LED is able to flash up to 120,000 flashed per minute at 9000 LUX with its 200 LEDs. A stroboscope is a piece of equipment that can make a rotating, reciprocating, oscillating or vibrating object appear still. This is referred to as a stop-motion effect. If a moving object appears to be stationary when observed with a stroboscope, then the stroboscope is attuned to the vibration frequency of the object. An industrial stroboscope is a measuring instrument commonly used to inspect stresses on different machine parts in motion. For example, an industrial stroboscope can be used in a print shop to evaluate the rotational speed of a printer roller. Thus, an industrial stroboscope also can be used as a tachometer to count the number of revolutions or measure the revolutions per minute (RPM) of a cyclically moving part. Before purchasing an electronic industrial stroboscope, one must consider the intended application. An electronic stroboscope can reach a flash rate of several thousand Hertz, making it possible to carry out optical inspections for very fast sequences. Therefore, the stroboscope's flash rate must accommodate measurement of the rotors, gears, cams, shafts, spindles, etc. to be inspected. In addition to the adjustment of the flash rate or flash frequency, modern stroboscopes also offer the possibility of setting a phase shift. This means that the flash pulse is delayed in such a way that the picture optically rotates. This makes it possible to move the marking brands on the rotating parts into a correct position. A key factor to evaluate when buying an electronic stroboscope is the type of light source used by the strobe. Modern light-emitting diode (LED) stroboscopes have nothing in common with the conventional Xenon flashers. In modern LED stroboscopes, powerful LED arrays enable comprehensive illumination of an object. Due to the scalability of the LED stroboscopes, even large parts like moving paper webs can be inspected with ease. For certain non-destructive testing applications, special stroboscopes that utilize ultraviolet (UV) LEDs may be required. The trigger of the luminaire is another important component of the stroboscope. Simple stroboscopes have internal regulators to control the LED luminaires or xenon tubes. Triggering from outside is not possible in these stroboscope designs. More complex stroboscopes are equipped with trigging inputs that allow external speed sensors to control the luminaires. Thus, the flashing of the stroboscope is always equal to the number of revolutions or oscillations of the object. This is particularly advantageous when different rotational speeds of rollers are driven. This is the case especially in the sphere of paper production or during the testing of printed products. In the case of handheld stroboscopes, the decisive factor is how the power supply is performed. Here it is of crucial importance how often the stroboscope is used. If the handheld stroboscope is used sporadically, a battery power supply is often sufficient. If the handheld stroboscope is used frequently, a rechargeable battery power supply is recommended. Fixed installation stroboscopes are generally supplied with an AC power adapter or powered directly from the mains. When acquiring a stroboscope, one should also think about the ingress protection (IP) rating required for the application. The IP rating or class specifies whether a device is dustproof or waterproof. If a stroboscope will be used in harsh industrial conditions, an IP67 rating is recommended for optimal protection against external environmental influences. If you need additional assistance in purchasing a stroboscope, please contact PCE's friendly and knowledgeable technical sales staff at or +44 (0) 2380 987 035 for PCE Instruments UK , or at or +1 (561) 320-9162 for PCE Americas Inc.